Position the steering column in the locked position to prevent the SRS clockspring from becoming accidentally over-extended, when the steering column is disconnected from the intermediate coupler. With the ignition key in the locked position, turn the steering wheel to the left until the steering wheel locks itself in position. Disconnect the steering column shaft coupler from the steering gear intermediate coupler. Place a drain pan under the power steering fluid lines and disconnect the fluid hose from the metal tube portion of the power steering fluid return line and allow the steering fluid to drain into the pan. Remove the tie rod ends from the steering knuckles. Remove the 2 bolts and loosen the third, mounting the ABS Hydraulic Control Unit (HCU) to the front suspension cradle. Rotate the HCU rearward to allow access to the cradle plate mounting nut and bolt just ahead of the HCU. Remove the front suspension cradle plate from the front suspension cradle. Remove the retaining bracket attaching the power steering fluid lines to the front suspension cradle. Using an 18mm crowfoot, disconnect the power steering fluid pressure and return lines from the power steering gear. Remove the 3 bolts and nuts mounting the rack and pinion steering gear to the suspension cradle. Lower the steering gear from the suspension cradle enough to allow access to the steering column intermediate coupler roll pin. Remove the roll pin and separate the intermediate coupler from the steering gear shaft. Remove the rack and pinion steering gear assembly from the front suspension cradle. Install the rack and pinion steering gear assembly into the front suspension cradle, providing enough room to install the intermediate coupler. Connect the steering gear shaft to the intermediate coupler and secure with roll pin. 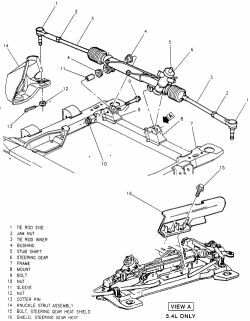 Place the steering gear assembly in correct position on the suspension cradle and install the 3 steering gear mounting bolts and nuts. Torque the bolts and nuts to 100 ft. lbs. (136 Nm). Connect the power steering fluid pressure and return lines to the correct fittings on the steering gear. Torque the power steering fluid line tube fittings to 275 inch lbs. (31 Nm). Install the outer tie rod ends to the steering knuckles. Torque the tie rod end-to-steering knuckle nuts to 40 ft. lbs. (54 Nm). Install the front suspension cradle plate to the front suspension cradle. Torque the 10 mounting bolts and nuts to 123 ft. lbs. (165 Nm). Install the bracket mounting the power steering fluid lines to the suspension cradle. Be sure the protective heat shields cover the entire rubber hose hose-to-tube connection of both power steering fluid hoses. Install the hose onto the metal tube portion of the power steering fluid return line. Install hose clamp on the return hose. Be sure the hose clamp is installed past the upset bead on the tube. Install the front wheels and lug nuts. Torque the lug nuts, in a star sequence, to 95 ft. lbs. (129 Nm). Lower the vehicle just enough to access the interior of the vehicle. Using the intermediate coupler, turn the front wheels to the left until the intermediate coupler shaft is correctly aligned with the steering column coupler. Connect the steering column shaft coupler to the steering gear intermediate coupler. Install the steering column coupler-to-intermediate shaft retaining pinch bolt. Torque the pinch bolt nut to 250 inch lbs. (28 Nm). Refill power steering reservoir, with the correct amount of clean, fresh MOPAR® Power Steering Fluid or equivalent, and bleed the system. Check the toe setting and adjust, if necessary. Road test the vehicle and check steering operation. Raise and safely support the front of the vehicle on safety stands. Remove the front wheels. Wire brush the tie rod threads and liberally soak with penetrating oil. Loosen the inner tie rod-to-outer tie rod jam nut. Mark the tie rod position on the inner tie rod threads. Remove the tie rod-to-steering knuckle nut by holding the tie rod end stud with an 11 / 32 socket while loosening and removing the nut with a box wrench. Using a puller tool, separate the tie rod end from the steering knuckle. If the joint is to be reused, do not use a wedge-type tool to hammer the connection apart or the outer tie rod end will be damaged. Count the number of turns when removing tie rod end. Install the new tie rod end the same amount of turns. Unscrew the outer tie rod end from the rack inner tie rod. Thread the new tie rod end onto the inner tie rod, the same number of turns as was required for removal. Install the tie rod end to the steering knuckle. Install the outer tie rod-to-steering knuckle nut. Torque the nut, using a crowfoot and 11 / 32socket, to 40 ft. lbs. (54 Nm). Install a new cotter pin. Check the toe setting. Adjust the toe setting to the correct specifications by turning the inner tie rod, taking care not to twist the boot. Tighten the jam nut to 55 ft. lbs. (75 Nm). Install the front wheels and lug nuts. Torque the lug nuts to 95 ft. lbs. (129 Nm). Re-check the wheel alignment and make any adjustments, if necessary. Road test the vehicle. The Supplemental Inflatable Restraint (SIR) system must be disarmed before removing the steering wheel. Failure to do so may cause accidental deployment of the air bag, resulting in unnecessary SIR system repairs and/or personal injury. Disconnect and isolate the negative (ground) battery cable. Allow the system capacitor to discharge for at least 2 minutes before continuing with the removal procedure. This will disable the air bag system. Make sure the front wheels are in the straight-ahead position. Turn the ignition key cylinder to the LOCK position and remove the key. Turn the steering wheel a 1 / 2 turn toward the left until the steering column becomes locked in position. Remove the 3 bolts attaching the air bag module to the steering wheel. Remove the air bag module. When carrying a live air bag, make sure the bag and trim cover are pointed away from the body. In the unlikely event of an accidental deployment, the bag will then deploy with minimal chance of injury. When placing a live air bag on a bench or other surface, always face the bag and trim cover up, away from the surface. This will reduce the motion of the module if accidentally deployed. Disconnect the wiring connectors from the air bag module, horn switch and speed control switches. Remove the routing clip for the wiring harness from the air bag module studs. Remove the steering wheel mounting nut from the steering column shaft and remove the steering wheel damper from the steering wheel. Using a steering wheel puller tool, remove the steering wheel from the steering column shaft. Do not thread the steering wheel puller tool bolts into the steering wheel more than a 1 / 2 in. or damage to the SRS clockspring will result. Do not hammer or bump the steering column or shaft when removing the steering wheel. Disengage the lock mechanism by depressing the 2 plastic locking pins. Turn the clockspring rotor clockwise until it stops, while the lock mechanism is disengaged. Do not use excessive force. From the end of the clockwise travel, turn the clockspring rotor counter-clockwise. The clockspring wires should be at the top. Engage the clockspring locking pins. Turn the clockspring a 1 / 2 additional rotation counter-clockwise from the center locked position. This should put the clockspring wiring at the bottom. The clockspring is now correctly positioned for installation of the steering wheel. Install the steering wheel onto the steering column shaft. Make sure the master splines of the steering wheel and steering shaft are in correct alignment. Be sure the flats on the steering wheel align with the formations on the clockspring. All wiring leads from the clockspring must be routed correctly. Install the steering wheel damper onto the steering wheel in its original position. Install the steering wheel-to-steering shaft retaining nut. Torque the retaining nut to 45 ft. lbs. (61 Nm). Reconnect the horn switch wiring lead from the clockspring, onto the steering wheel horn switch wiring. If equipped with speed control, reconnect the speed control wiring from the clockspring onto the speed control switch. Install the wiring lead from the clockspring onto the air bag module. Make the wiring connection onto the air bag module, by pressing straight in on the connector. Be sure it is fully seated. Install the air bag module to the steering wheel and then install the 3 air bag module attaching nuts. Torque all 3 air bag module attaching nuts to 100 inch lbs. (11 Nm). Connect the DRB or equivalent scan tool, to the ASDM diagnostic 6-way connector. Turn the ignition key to the ON position. Exit the vehicle with the DRB, and install the latest version of the proper diagnostic cartridge into the DRB. Make sure there are no occupants in the vehicle and reconnect the negative battery cable. Using the DRB, read and record active or stored fault codes. Take appropriate actions to correct any faults. Erase stored fault codes. If problems remain, fault codes will not erase. From the passenger side of the vehicle, turn the ignition key toOFF and then ON , observing the instrument cluster air bag lamp. It should go ON for 6-8 seconds, then go out. This will indicate that the air bag system is functioning normally. If the air bag warning lamp fails to light, blinks ON and OFF or goes ON and stays ON, there is an air bag system malfunction. Test the operation of any steering column functions such as the horn, lights or speed control system. Road test vehicle. Be sure the speed control and steering systems are functioning properly. The steering gear transfers the rotary motion of the steering wheel to a linear motion used to steer the front wheels. Two types of steering gear are in use today, the standard gear box and the rack and pinion. The standard gear box uses a worm gear that is rotated by the steering wheel to move the pitman shaft. The worm gear contains spiral cut grooves that mesh with a sector gear at the top of the pitman shaft. The spiral action of the worm gear causes the pitman shaft to move the steering linkage in a linear motion. Power steering is achieved by using hydraulic pressure to assist in the rotation of the worm gear. Rack and pinion steering provides a much simpler method of converting the circular motion of the steering wheel to linear motion for steering. The steering column attaches to the top of the rack and pinion unit and rotates the pinion gear. The pinion gear actuates the rack, which is a simple straight shaft with teeth cut in the top. The rack will simply move back and forth, in a linear motion, in response to the pinion gear. The only steering linkage used is tie rods to indirectly link the rack gear to the steering knuckle. Vehicles with power rack and pinion steering use hydraulic pressure to assist in rotating the pinion gear. Lock the steering wheel straight ahead and drain the steering fluid. Remove the battery cables, front wheels and steering column coupler and front emissions vapor canister. Disconnect the hose at the steering cooler and let it drain before plugging it. Uncouple the tie rod ends and remove the lower control arm rear bushing bolts. Disconnect the crossmember reinforcement. Unhook the power steering lines and remove the mounting fasteners from the steering gear. Disconnect the intermediate shaft coupler and remove the gear assembly from the undercarriage. Mount the new steering rack and then partially insert the shaft coupler rolling pin into the intermediate shaft coupler. Tap it into the coupler with a hammer, then attach the coupler to the gear shaft. Insert the installer tool through the roll pin center and secure with the knurled nut. Keep the threaded rod stationary and pull the pin into the coupler by turning the knurled nut. Reverse-assemble the remaining parts. Tighten the 14mm steering gear fasteners to 135 foot pounds, the steering line connections to 25 foot pounds, M14 crossmember bolts to 113 foot pounds and M12 to 75 foot pounds, the control arm bushing bolts to 45 foot pounds and the tie rod nuts to 55 foot pounds. Fasten the power steering cooling hose with its clamp. Replace the front wheels and connect the column shaft coupler. Apply 21 foot pounds of torque to the pinch bolt. Reconnect the battery cables. Fill the steering system and bleed it. Check to make sure you lines aren't leaking and your wheels are aligned properly. Depending on your Voyager's options, you may also need to remove the front emissions canister, power steering cooler-to-cradle bolts, bolts connecting the leak detection pump to the cradle crossmember and all wheel drive power transfer unit. Keep track of the size and locations of the bolts as you remove them. The many bolts and sizes are easy to confuse. Remove or disconnect the following: CAUTION Failure to disconnect the intermediate shaft from the rack and pinion stub shaft may result in damage to the steering gear. This damage may cause a loss of steering control and may cause personal injury. NOTE Set the steering shaft so that the block tooth on the upper steering shaft is at the 12 o'clock position. The wheels should be straight ahead. Set the ignition key lock to the LOCK position. Failure to follow these procedures could result in damage to the SIR coil assembly. Support the frame at the center rear. NOTE DO NOT lower the frame too far. Engine components near the firewall may be damaged. Power steering lines with new O-rings to the steering gear. Torque the fasteners to 20 ft. lbs. (27 Nm). Raise the rear frame to its original position. Fill and bleed the power steering system. Check the front end alignment and adjust as needed. Labels: steering coupler location and rack and pinion replacement on Plymouth Car.